President Bill Clinton was famous for saying under oath during a deposition within a scandal investigation, "That all depends what the definition of 'is' is." So in a similar way author David Millett uses the word twice in his title, "The Truth About Truth." He defines truth as not binary; black or white, right or wrong, nor true or false, but rather a variable degree of understanding and subject to change over a period of time. Defining the cognitive constituents of what comprises logical analysis in the realms of the scientific method, religious beliefs and evolution, Millett discusses the historical morphisms of the human understanding of truth in a way that expands upon the variations of the reality of perception. He provides the reader with a brief history of "Truth" -- from the derivative linguistic formation, throughout the Greek philosophers and early scientists over time who organically grew the concept, to the modern scientific method used today incorporating repeatable, measurable and observable techniques all as prerequisites for allowing a theory to be granted the status of being "True." He uses easily described situations to reflect upon a variable view of details necessary to represent the strength of the truth, analogous to links of a chain. In fact, graphically Millett inserted into his book a scale of truth with an image of a chain to illustrate his articulated concepts. A terse book on a rather immense topic, The Truth About Truth is easily read in one sitting. It is generally written at a high level allowing for readers of all mature ages and backgrounds to fully understand his message. Millett asks many questions, making for his writing to be conversational and thought-provoking. One can tell Millett cherishes the subject of truth. His enthusiasm for bringing into perspective facts being true are contagious to the reader. What I found exceptionally interesting is the chapter on how mental illness and the belief in supernatural phenomena overlap, referencing some of the academic studies that have been done to date. 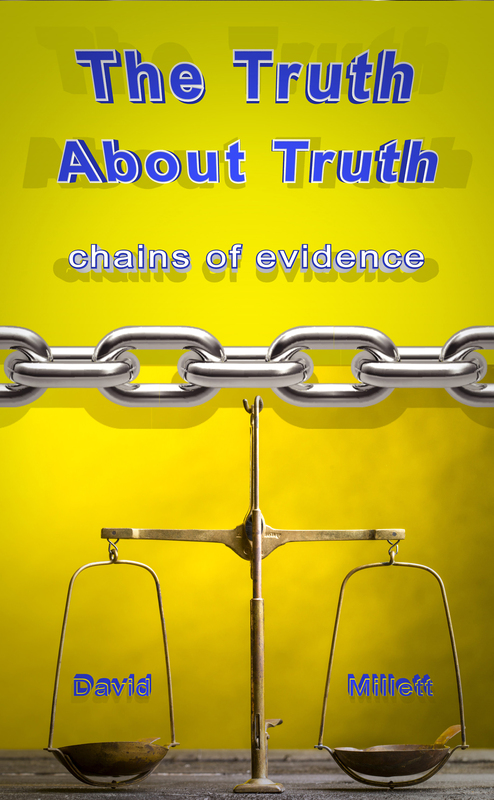 I believe The Truth About Truth: chains of evidence is intended to arouse further interest in the subject of those that are interested in pursuing a deeper understanding into the philosophy of the human mind and how perceptions mirror reality. In a way it is the first step on answering the eternal curiosity of our own existence in the Universe (or Multiverse as some theorize). This is an excellent book to take on a flight, when you are moving at a high fractional of the speed of sound, at an altitude whereas our frail bodies couldn't survive; as we put our trust in the truths of engineering, which protect us and sustain our traveling during these moments. Is it possible to have different versions of truth? Is a truth necessarily subjective and relative to situation? How much does truth matter to us, and in what ways does it control our decisions, even our lives. Does the concept of truth promote the accumulation of knowledge or hinder it? This is a smart and insightful book that asks many such questions. It examines "truth" and questions assumptions about the idea of truth. It puts "truth" under close scrutiny and comes up with a useful tool for examining one's own, and society's assumed truths.